The horns we bought were African Gemsbok. These horns were 30'' and 32'' horns. The ones we just ordered recently were 37''. The smaller of the 2 is borderline at best. More popular and fitting would have been the Asian WaterBuffalo, Very expensive. Gemsbok we will try. 2 horns off Ebay go for around $45. The idea of the horn composite bow is a wood core in the center, with a horn belly, and several layers of sinew. Layed up in layers as modern fiberglass bows, they are short in length with heavy recurves. The horns have raised rings goin 2/3rds their length. These rings were flattened by a wood rasp. Rasping away the rings took an hour and a half. All the rings were flattened out and a line was drawn down the center of the horns on the side. They were ran through the bandsaw and split into 2 even sections each. The horns are hollow only so much in their length. in theses goin about 30-32'', The last 7-9'' were solid. The cresent shape of the half horn has to be flattened. Each piece is sandwiched between 2 boards and clamped. We tried 1 piece steaming it out of the boards and after steaming, clamping it down but didn't work so we tried this and it worked. It took these 2 pots brought to a boil, the boards clamped together holding the horn was set above it and it was wrapped in aluminum foil and steamed for 15 minutes. As it steamed the clamps were tightened. We are still expiermenting with the steam, clamp boards deal and will try another approach. but this did work. I used a heat gun to straighten the horn. Heat a section and then flatten until you reach the end. wow that did work good. Thanks Jhoniel, dry heat does a great job, Got out the heat gun and it works. We heated the horn til it was to hot to touch, heating a 8 inch section and flattening 4'' at a time. We put a piece of board on it and under it and tightened two 5'' clamps as tight as possible. All advice is appreciated. Here is flattening 4'' sections at a time, It takes a long time for horn to cool off, close to an hour even in cool temps. One horn Crow king was heating when later scraped seemed brittle in a spot. I wonder if this could be a downside to dry heat? What profile bow are you guys making? When I saw that picture of the horn on the bandsaw I cringed! I just hate the smell of burning horn. Whenever i am cutting a lot of horn I move my bandsaw outside. Otherwise my wife will kill me! lol....the things we do for the love of bows and arrows. Here's a 42 inch piece of osage I am thinking about useing for the core wood. It has some natural reflex and I can get 1 whole unviolated growth ring that will be scraped down to 3/16 of an inch. The only problem is that it has some very small pin knots that I think will be in the spot that the bow does all of the bending. What do you think about the pin knots, should I still use it? I can't wait to see the rest of this one. Awesome! Heres mine with the sinew wrapped and drying, I used waterbuffalo horn. Osage should be good if you get it thin enough, this is boo and mulberry with a splice at mid-limb.appx 50 back sinews shredded into pieces as fine as hair, and applied in two layers, only longest of the sinews used from each piece, shorter pieces saved for glue. wow. That is awesome. I need to try to build one of these things some time. Very impressive. Good Job IndianGuy! How long is the bow and how thick is the limbs, what poundage will it be, will it be ready to tiller after this layer of sinew dries? I have decided to use bamboo on mine instead of osage. Crow this is all new to me as well, Not sure on the poundage, will just have to wait and see. Im sure there will be some scraping here and there on the belly after I string her up. Here are some Pics I took along the way. I filed my horns down to where they would bend in either direction., epoxyed them to the core and butted the ends together at the handle. Bow basking in the mornign sun of the east window. The string bridges have been added made from three layers of deer rawhide soaked to shape and glued together, leather binding sewn around the handle which will have to be removed when bow dries, sinew added over 1/4" to the back. Crow..sorry I forgot to tell you the length....tip to tip 48" You might also consider binding your horn with rope as well as clamps, I used nylon and the epoxy didnt stick to it so it was easy to remove when epoxy set. Cool. Ive been wanting to try one of these kind of bows some day. Not my intent Juneauhunt,,,,,wont post anything else on this thread, just trying to answer and help a fellow bowyer. Later! Stealing thunder or not it's very educational! I am just waiting on some free time so I can start my own. Good work guys! Ditto, Good work guys! Keep it coming. I am sure that Crow King is glad to see some other attempts at a horn bow. Certainly, you did not attempt to highjack the thread, and as to "stealing someones thunder" you have posted other pictures of your composite bow, on here, so you surely ain't "stealing thunder." Juneauhunt needs to take a chill pill. Seems to suffer from a high stress level, that he wished to unload on others. We needs to see a lot more pictures of the projects from Crow King and you, both! I like seeing many pics and others attempts at something difficult to make like this. I was thinking that piece of osage looked too nice to use on the horn bow. So I think its good for you to save it for another more self bow project. IndianGuy, post more picures of your bow as you keep working on it if you want to. I enjoyed seeing it and can use all of the help I can get. The title of this thread was "an attempt at hornbows" IndianGuy posted some pics of his, WHAT'S THE PROBLEM?? I love watching talented people make things I have no clue how to make. Keep it coming one and all. MORE PICTURES!!!!! FROM ALL OF YOU!!!! IS IT DONE YET??? I worked some more today on it, I'm still thinning my horns and flattening em. The last day I worked on it, bout 4 days ago I was coughing up blood, and today as soon as I started and even right now i'm coughing, wear a face mask, bone and horn, cutting or rasping will kill you. Crow king has his horn flattened and cut to size, so he started his core, he used bamboo, using the outer side of the bamboo for his sinew backing he rasped off the nodes and flattened the inside part of the bamboo for glue up to the horn. He then steam bent the ends of his limbs with a bend that will follow the curvature of the siyahs. with the bamboo steamed it is quickly clamped into the bend and allowed to cool. We took some scrap osage and cut us out some siyahs 8 1/2'' . They were steamed and then clamped into a form until cool. Bent and clamped into shape 1'' x 1'' x 8 1/2'', It will be a 3 1/2'' V splice with 5'' of siyah sticking out of the limb. Here is a picture of Crows horn, core, and siyahs, Next will be to cut in the V splice and glue in the siyahs. I cut the V splice and cut the siyah's roughly into shape. More to come soon. Hey Guys when you're done with the bow do a build along on a thumb ring, There difficult to make. What a cool post. That one bow reminded me of the Turkish "coathanger" bow the late Rev. Stacy Groscup had in his collection, "the evolution of the bow." I admire you artisians. Great work. When Bob Thompson owned the ZIPPER company he built Stacy Groscup a riser made from an elk antler. Shoot Straight, Frank Addington, Jr.
Crow had cracks develop in each recurve of his core after steam bending. These cracks developed in the soft wood under the power fibers. They were filled with super glue and we hope they will not be the downfall of this bow. those don't look good. I think I would try that again and get it right if it was me. The V splice looks good. I'm going to have to try one of these as we have water buffalos galore here in Thailand and more bamboo than you can shake a stick at. Here is a picture of crows' splice job, he laid it in with Urac185. He used the Urac as he thought it would be stronger and safer than hide glue. The excess siyah that is on the belly side is rasped down flat as the horn will cover this. On the back side where the sinew will be, it is tapered down in thickness, at the splice there is 5/8" of siyah raised above the core this continues a taper where it goes flush into the core. Here is the tool we attached the horn to the core with. It is simply a piece of wood with a hole drilled through it, a rope is ran through it and twisted around the piece, the leverage provided by this tool is said to be 200 pounds per square inch, it is doin some heavy duty pressing. Here is a picture of wrapping the bow with the tool above. Clamps were used to hold the horn in place til it was wrapped and then clamps were placed about every 1"-1.5"
Here is a glue line picture. The horn was roughed up with a hacksaw blade, both the core and horn had fresh scrapes to remove any grease or oils from handling them, then acetone was applied to both for further degreasing. Hide glue was used, the core and horn were warmed before a heater and a heavy coat of glue was put onto the core and both horns which let it soak up all it could take and allowed to dry. The thinner the hide glue the better it penetrates into the wood and horn. This layer of hide glue will dry and seal, it will keep the glue when it is clamped up from soaking into the wood and horn. After glue up a look down the bow told that there was twist in each limb and needed adjustment. It was placed back in front of the heater until the glue reliquify, The limbs were twisted and adjusted. When I said a heavy coat of glue, you just want to give it glue till it quits soaking it up. You don't want a actual layer of glue on the pieces before glue up, just keep it wiped thin but give it all it wants. I worked on mine a little more too, almost got the horns ready. My horns will be 20" each in length, 1.25" wide tapering to 1" at the tip. I will use bamboo for the core and show the starting of that, I missed showing that on Crows bow. They are clamped down and rasped and scraped flat. That would be me, Thanks again. I would have expected you to glue it it up with more reflex. Are you expecting the sinew to do all the reflexing? Ryan, On YouTube there is a video of a Korean Master as they call him that steams his bow into a crab shape before sinewing, we will try that soon. On these 2 bows we will attempt to draw the bow into a heavy reflex by attaching a string to the end of each siyah and pull it together a couple inches for the first time, then lay the first layer of sinew, then after a week we will draw them more say 4-5'' and apply the second sinew layer and so on. We hope all can be done with 3 sinew layers, but 4 to 5 layers are known to been done. We have just ordered elk tendon and soon will be sinewing. Also have bought 5 or 6 horns and ordered 10 bamboo planks so more hornbows to come. Took the string and clamps off, Crow King had a fine glue line, it is said 2 thousands of an inche is the preferred thickness of the glue line. Looks like Crow did it. Time for a handle. Crow used Black Walnut for his handle and then made it perfect flat for glue up to the bamboo. His handle is 6'' in length and after drying will be rasped down to shape, tapering down to the bamboo on each end. The crown of the bamboo was also flattened for the handle for a tight even glue up. Forest do you have the URL for that video? On the bamboo core on this one we think we have been taught a few things. 1st** On this bow the outer section of the bamboo was used for the Back of the bow, This could be why there was cracking after the recurves were steamed in, being that the softer wood was handling the compression of the recurve. Had we turned the outer side of the bamboo to the belly for glue up to the horn the compression would have been on the bamboos power fibers, and might not cracked. 2nd** Being that the outer side of the bamboo was the back and it being crowned, when the horn and core were glued up, the crown of the bamboo caused cracks running length ways on the limbs from the V splice for 2'' on one limb and .5'' on the other. Perfect flat on both sides of the core could have prevented this. The cracking came from the power of the rope when wrapped around it. IndianGuy all advice is appreciated, however here is what we thought we would do. The video we have with Jeff Shmidt gave us these dimensions : a bow with an overall limb thickness of 5/16" will yield a Roughly 60# bow....7/16" close to 100#.... this being with a limb width of 1 1/4" tapering to 1" at the tip of limb. As of now Crow Kings bow has a core and horn thickness of 1/8" each that tapers in limb width and horn thickness toward the tip. The taper of thickness toward the limbs tips where it is thinner are comparable to 3-4 sheets of paper. Crow King says he is gonna slowly draw the bow into reflex now to check how it bends and scrape away where it does not. So he will be removing horn in places. I'm not sure what this will do, but he is gonna try it. He would like a finished bow weight of 80-90# and if the siyahs do what they are said to be able to do, it will draw and feel like a 70# bow?? IndianGuy you said above your horn and core together were 1/4'' you then added 1/4" of sinew. How many layers of sinew made up your 1/4" ? Forest Archer is this the vid you talked about? two layers, I used the longest pieces I could find. I think this bow is going to be to strong for me. I put my layers on thick with a lot of hide glue. I think there are a couple more on youtube that are better quality titled "the asiatic composite bow"...or something to that effect. Only problem is there not in english. I found this one as well, but the other one refers to the bowyer as Master. Thanks for posting these Buzz, the last one was the one I was talking about. It doesn't show him heating it before bending it but the bamboo is scorched black on it in several places. I decided to decrown the bamboo giveing the core a flat back. The core was tied into 7 inches of reflex measureing from the floor up to where the siyah's start out of the limb. I put down a layer of long back sinew that covered the whole limb and overlapped at the handle. I tied the limbs at the handle and siyah's to keep the sinew from lifting up while shrinking. The sinew laps over the edge of the limbs and about 3/8 inch of the horn on the belly. I tied the bow into some more reflex and put down another layer of sinew, I put long bundles of sinew over the part of the limb that is going to bend and short pieces over the handle and siyah's and then wraped the bow with string so the sinew wouldn't lift up while drying. The second layer of sinew lifted up on both limbs, so I pulled it off and put down a layer of glue and then built the handle up some more with short pieces of sinew to stiffen the handle area. I think greasy sinew is why it pulled up, I tried washing the sinew out with dish washing liquid but it must not have got the grease out. More sinewing to come soon. This is turning into a spectacular thread--many thanks for the effort involved in sharing it here. Best of the luck finishing this bow--the work is truly impressive. I put the second layer of sinew back on using deer backstrap sinew, It layed down good. I'm going to give it a week to dry and put the last layer on. Were still following you. Good post & thanks for your time & effort. looking good. I thought I had read before that you need to let the layers of sinew sit for months before adding to them and that is why the horn bow takes a year or more to make?? In the case of the Korean horn bow, the reason it takes a year is not only do some processes require an amount of time to cure, but also some things can only be done in certain seasons (i.e. gluing cannot be done in hot weather). how cool does it need to be for the glueing? Gaur, it needs to be warm when glueing with hide glue. I do my sinewing in the house in the winter time. I tied the tips together and put down the 3rd layer of sinew using long back tendon that covered the whole length of the limbs and overlaped at the handle. I decided to put down one more layer of sinew after this one dries. The last layer I am going to lay down individual strands of sinew making the back flat. very cool. I really enjoyed this thread.. the videos were interesting too. look forward to further updates as you make progress. Im anxious to see this bad boy braced and flinging arrows!!! Great thread Guys! I've been busy building selfbows lately. The hornbow is still drying, it has reflexed until the tips are touching without being tied together. I decided to rasp the sinew off the belly even with the edges instead of letting it overlap. I need to wrap where the syahs are spliced and put a bridge on it. Forrest archer and I will probably try to string it up within a couple months or less, we'll be sure to post what happens. still can't wait to see how it turns out. For flattening the horn... could you put the pieces into a water-filled steel pipe over a fire & boil it? I boiled some buffalo horns for a buffalo bow, Like the one in primative archer this month. Works good if you can get it clamped down before they cool off too much! Still had to use the heat gun on part of it. I've used the dry heat to flaten small pieces for tip overlays, I liked the dry heat better. Hows the bows comin along...Need an update!!!!! I made a spacer from a piece of horn to fill in the gap on the belly where the horn strips meet. I'm getting ready to wrap the syah's and put the bridges on. The limbs are about 7/16 of an inch thick, i'm guessing it will be about 100 lb draw weight if it doesn't blow up. Here it is after I glued the spacer in, filed it smooth, wrapped below the string knocks. I thought it would be a good ideal to wrap where the riser fades into the limb. Awesome job. Thanks for the pics. Forrest archer and I got it pulled this far and noticed the right limb was weaker, so we stopped and decided to try to get some information on tillering. 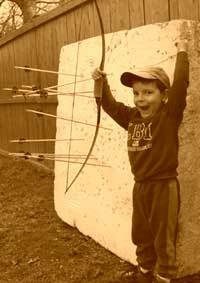 Does anyone have any experience tillering hornbows? What a ton of work you guys have in this thing, holy moly. I hope you can successfully shoot the thing. I pulled the bow back down on the peg board and noticed the sinew was tearing in a straight line across the back just out from the fades on the right limb, I'm not sure yet what caused it. I am going to soak it in water to take it apart and use some of the parts on another hornbow that I am getting ready to start on. I have a better horn that will make a longer bow. I've learned a lot from this one and think I can make a shooter out of the next one. I'll be posting pics of the next one. Sorry to hear that your bow had a problem. You have sank a lot of effort, a few tears, and (probably) a lot of cussin' into that project. I hope this thread isn\t dead as I have had it in my fave's since the beginning. We were discussing this a week or so ago, I think Crow is ready to give it another go. Might happen late Fall/early Winter. Just found this thread. Was it a success, failure? Im also curious about the final result!